Conveniently located in the heart of Taman Tun Dr Ismail (TTDI), Premier Clinic offers a range of aesthetic treatments to address any concerns you might have about your look and appearance. Our fat loss and body contouring treatments, Vanquish and Zeltiq CoolSculpting, are available at our TTDI branch. The state-of-the-art Ultherapy Focused Ultrasound treatment for non-surgical skin tightening, as well as hair transplant procedure, are also available at this branch. Other available treatments include Botox, fillers, SilkPeel, thread lift, Biofibre hair implant and many more. 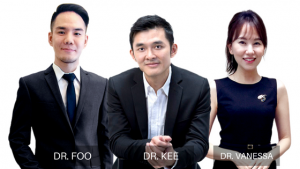 The medical professionals you will meet at TTDI Branch are Dr Kee, Dr Vanessa and Dr Foo. Dr. Kee is a highly qualified and very experienced doctor, with a degree in Medicine from University Sains Malaysia. He is a pioneer credentialed LCP (Letter of Credentialing & Privileging) Medical Aesthetic Practitioner in Malaysia (2013/ 2014). He also has a Diploma in Aesthetic Medicine from the American Academy of Aesthetic Medicine, a Diploma in Primary Care Dermatology from the Institute of Dermatology Bangkok, and a Graduate Certificate in Primary Care Dermatology from the Academy of Family Physicians of Malaysia. Dr. Vanessa is highly experienced in natural cosmetic enhancement to achieve the Asian V-shaped face, face lifting with Ultherapy and threadlift, nose augmentation (with Korean technique), eyebag reduction and dark eye circle treatment, cheek and chin augmentation, facial rejuvenation with various injectables and vaginal tightening laser therapy. She has a Bachelor of Medicine and Bachelor of Surgery (MBBS) from University of Malaya. She also holds a Certificate in Aesthetic Medicine accredited by the American Academy of Aesthetic Medicine (AAAM). Dr. Foo has a medical degree (Doctor of Medicine) from UCSI University (with first degree honours), and has performed the FUE hair transplant procedure for happy clients, with satisfactory results! He is a member of the American Academy of Aesthetic Medicine (AAAM) and Academy of Family Physicians of Malaysia (AFPM). TTDI Branch is located on Jalan Wan Kadir 2, at the same block as Maxis and Pizza Hut. The clinic is just next to the TTDI wet market. One car park lot directly in front of our clinic is reserved specifically for customers on a first come, first serve basis. There is also plenty of parking available a 1-minute walk away at the TTDI market behind the clinic. Premier Clinic TTDI branch is open to the public from Tuesdays to Saturdays. To schedule a consultation session with our professional aesthetic doctors and staff members, kindly call us at +603-7732 5552 or email us at contactus@premier-clinic.com. We offer FREE consultation.